The Kilimanjaro Agricultural Training Centre has offered to train agricultural experts in East Africa on the improved production of rice. Moshi — The Kilimanjaro Agricultural Training Centre (KATC) has offered to train agricultural experts in East Africa on improved production of rice, one of the staple food crops in the region. This was affirmed last week by the project coordinator, Mr Motonori Tomitaka, at the end of an eight-day training course on improved rice growing for agricultural extension officers from Burundi. He said the project supported by the Japan International Cooperation Agency (JICA) is targeting to raise the productivity through application of the new technologies. "The project will cover the entire East Africa but we have started with Burundi because of the high demand for increased production of rice," he said. The official cited a run down of problems facing the production of rice in the region, one of them being lack of the irrigation equipment or ageing of the existing ones. Mr Tomitaka said the Moshi-based KATC was ready to offer all the required technologies in the production of rice given its experience from Japan and South East Asia. Besides the 12 agricultural extension experts, the training for Burundians involved other officials dealing with procurement and supply in the public institutions. A procurement officer from Burundi, Mr Kennedy Samahiro, said he was sure production of rise in his country would rise with the application of the emerging agricultural technologies. According to him, rice cultivation in his country has largely remained manual and has not involved the application of machinery as is the case in most of Asia. A leader of Burundi farmers' group, Mr Jean D'Arc Mutumwanka, said his country would mostly benefit from the irrigation techniques for the rice fields. 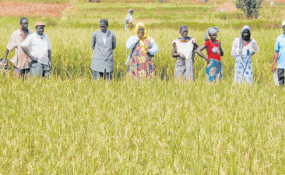 Mr Shadrack Msemo, a trainer at KATC, said irrigation schemes in rice production in Tanzania and other countries in the region have largely collapsed due to the wearing out of machinery and shortage of experts. KATC is one of few institutes under the Ministry of Agriculture and Food Security offering specialized short courses in agriculture, with special emphasis on irrigated rice farming improvement. The centre aims at enhancing the technical capabilities of field personnel and rice key farmers with respect to irrigated rice cultivation through practical training and field tours. KATC, situated at Chekereni some 17 kilometres south east of Moshi, is well equipped and staffed with qualified and experienced trainers in the fields of irrigated rice cultivation, extension, water management and rice mechanization.